Based on OverMoon's swap a few months ago here. Send 1 partner 1 instant postcard. 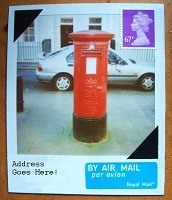 An instant postcard is an instant picture sent naked through the mail. The picture could be a Polaroid, Fuji Instax, Impossible Film or any other instant film you may know. BUT NO FUJI INSTAX MINI - I have experimented with this before and it's very hit or miss as to whether they ever arrive! Put stamps/mail label if needed directly on the picture and write your partners address in the white area. We all know that Polaroid etc. film is expensive and that we sometimes take duff photos. Please send your partner a passable picture - you don't have to be a top photographer at all, but try not to send something totally unrecognisable and out of focus or a duff test shot reject. I will be checking all participant's ratings and will decide participation on a case-by-case basis. Generally no recent 1s or 3s but I'll check and message if necessary. Hello! Can I join this swap if I use a Holgaroid with Fujifilm FP-100C? Just wanted to make sure it's allowed. Thanks! @mag - I'll admit I'm not sure what one of those is! Do you have an example? I suppose the most important thing is that a Polaroid/Instax etc. is more sturdy than a regular film photo and has the classic white border. So if it's like that then it'll be fine - but as I say, do you have an example? It looks something like this. Are they still selling Polaroid instant film? I thought it was defunct? Would digital pics count if they were mounted sturdily in the same format as a polaroid? @twobluecrows - As @OverMoon says, TIP makes it now although it is a little expensive! As for digital photos, for this particular swap the focus is definitely on instant photos. However, using well-mounted digital pics for postcards is a fine idea - go ahead and make a swap with that theme if you're not able to do this one! Oh yeah ! I was thinking on this . I'm in, i already have my postcard, yay !